Today, for cheap generic viagra mail order pharmacy Follow Friday, I want to introduce you to the marvelous, magnetic, mesmerizing Lynn Rose. I urge you to learn more about Lynn. Did you know that if you have low blood sugar (hypoglycemia) today, it could turn into type 2 diabetes tomorrow — well, maybe not tomorrow, but five, 10, 20, 30 years from now? But what if you were able to prevent that from happening? Better yet, what if you could Thrive Sugar-Free for 20 Years after you were diagnosed with hypoglycemia (low blood sugar)? How would you mark the occasion? That was my challenge. Earlier this week (April 15), I marked 20 Years Sugar-Free. Initially, I kicked sugar on doctor’s orders in 1998 because I had hypoglycemia (low blood sugar), which triggered a whopping 44 ailments, including brain fog, heart palpitations and anxiety. A few months ago, I began to consider my challenge. How could I celebrate 20 Years Sugar-Free? After all, I couldn’t or wouldn’t eat a sugar-filled cake or processed carbs. After all, I’m a recognized sugar and carb expert, the woman people call The Cravings Ninja™, and the bestselling author of the books, Sugar Shock and Beyond Sugar Shock. Then, a few months ago, it hit me. The best way to celebrate 20 Years Sugar-Free would be to support the amazing woman, Roberta Ruggiero , who’d been so instrumental to my kick-sugar success. …So today, to celebrate my Thriving 20 Years Sugar-Free, I’m pleased to share what my gift to the Hypoglycemia Support Foundation has made possible. Roberta and the HSF CEO Wolfram Alderson worked hard to develop this HSF infographic, which will teach you about low blood sugar, a little-understood blood sugar disorder. 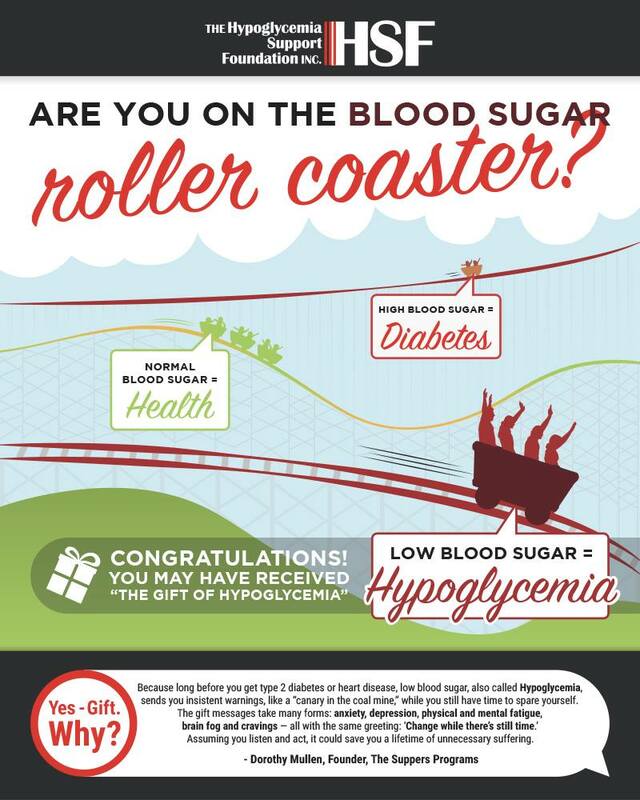 See the amazing HSF new infographic now on the Hypoglycemia Support Foundation website. Then share this infographic with your friends, loved ones and social media buddies so you all can find out if you or your loved ones are one of millions on the blood sugar roller coaster. You could save people of sooooo much suffering! Share this infographic with millions of people worldwide, who badly need this information. See the infographic here on the HSF website and then share this infographic with all your favorite peeps. click here Note from Connie: Today, it’s my pleasuret to present a guest post from my colleague Yuri Elkaim, author of the new book, The All-Day Energy Diet. For instance, click here Dr. Linus Pauling, two-time Nobel Prize recipient, was the first to show that cancer cells cannot grow in alkaline environments. We’d like to hear from you. What is your Big Confession? It feels great to do! Join us! Together, let’s move on to create a glorious life. Talk to us now. Last week, before heading out of town to hang out with some fellow health experts, I made what I consider My Big Carb Confession. I finally came clean about how for months after my Mom passed away, when I was walloped by grief, anguish and symptoms of PTSD (Post-Traumatic Stress Disorder), I quit walking my clean carbs talk. What a relief it was to finally admit that I’d had a relapse! That freed me up to plunge into my big plans. Indeed, admitting to you that I had flopped has now unleashed a new enthusiasm and excitement in me to serve you. In fact, not only am I back to eating cleanly (and have been for a year), but I’m also working on an exciting new book to help you Tame Your Cravings™. 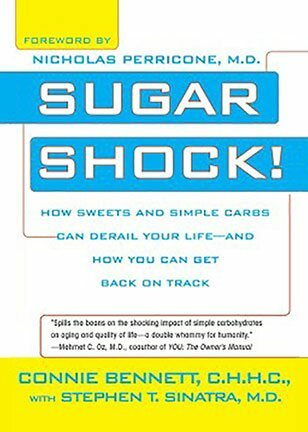 Although I cavorted with carbs in a big way — shoveling in movie popcorn, onion rings, and corn nuggets — I did, however, continue to steer clear of my old sugary favorites, which I’d quit in 1998, as I reveal in my books, Sugar Shock.and Beyond Sugar Shock. My Heartbreak Eating had led me to pack on 20 extra pounds. .
, PTSD, and anguish, I kept ignoring what I know well, which is that processed carbohydrates quickly convert to sugar in your bloodstream, which is why, for years I’ve been calling them quickie carbs, fast carbs, culprit carbs and much-like-sugar carbs. carbs I’d been inhaling had been sending me flying in and out of Sugar Shock, or more accurately, Carb Shock. Hence my many symptoms of depression (and how! ), mood swings, crying spells (lots of them), insomnia, and big brain fog. Of course, grief over the loss of a loved one is tough enough to face, but when you eat crappy carbs, you exacerbate your many ailments, which is what happened to me. Anyhow, for about a year, I’ve been back to eating cleanly, thanks to lots of healing work and workshops, including grief counseling, therapy, EFT (Emotional Freedom Technique), energy work and many cool tactics, which I’ve created or discovered to help me confront those Crazy Carb Cravings™. I’m also happy to report that I’m close to my weight loss goal. I’ve shed 18 of the 20 pounds I gained doing Heartbreak Eating, and I’m now working off the additional inches to get back to my previous slim, toned figure. Making My Big Carb Confession.was a huge deal for me. I was embarrassed to admit that I fell offf the wagon and that I was no longer doing what I encourage others to do. For months, I’d been thinking about coming clean about my carb relapse. That’s why I need and want to thank the amazing Sean Croxton, whose Confessoins of a Health Blogger post finally gave me courage to make My Big Carb Confession. I urge you to get on Sean Croxton’s mailing list. Sean is a passionate health and fitness professional, who is dedicated to revolutionizng the way the world thinks about health. His Underground Wellness videos and Underground Wellness Radio are quite popular, and I encourage you to listen to these exciting programs, where you can catch Sean interview such top names in health and fitness such as Paul Chek, Mark Sisson, Dr. Robert Lustig, Julia Ross, and Cynthia Pasquella.. Anyhow, thank you, Sean, for inspiring me to join you in making My Big Carb Confession. Do you crave pasta but are worried about all the carbs? Meet shirataki, the traditional Japanese food I recently discovered, thanks to vegetarian chef Sarah Nee, who uses it to create an amazing Organic Coconut Kelp Noodle dish. Yummy! If you haven’t yet tasted this calorie-free, fat-free, gluten-free noodle, you’ve been missing out on a great food and find. Sold on varying websites and stores, The NoOodle, The Miracle Noodle, or etc. is the ideal weight-loss food for people, who are seeking to restrict sugar, calories, and carbs. Often called konnyaku noodles, these traditional Japanese textured noodles are thin, chewy, translucent, gelatinous, and have almost no flavor by themselves. Super low in carbs with zero calories, their key ingredient is a water-soluble dietary fiber called Glucomannan, which is derived from the root of yam-like Konjac plant grown in Japan and China. If weight is an issue with you, this food is your ally. In fact, Shape Magazine called Glucomannan The Weight-Loss Supplement Dr. Oz Loves. But weight loss is only one of its many virtues. Not only does this food help you shed weight, but it is highly versatile. For instance, you can create Chicken Vegetable NoOodle Soup. Or you can make Primavera NoOodle and Mama Mia Marinara. (If dairy is an issue, I recommend skipping the Parmesan cheese). You also could try Split Pea Dahl Soup with Miracle Noodle Rice, Spinach, and Tomatoes. Manufacturers of this versatile product note that this zero-calorie, low-carb food has many benefits. Delays hunger and lowers calorie uptake. Glucomannan in NoOodle increases the viscosity of gastro-intestinal content and extends the feeling of fullness so one doesn’t feel hungry for a longer period of time. It also reduces rate of food absorption in the small intestine. Promotes satiety. Glucomannan is made up largely of water, which fills one up quickly, making you feel satiated.. I'm pleased to announce that the Sugar Shock Blog just got a new banner. It now includes the cover for both my first book, Sugar Shock, and my upcoming book, Beyond Sugar Shock, which comes out in June from Hay House. Both book covers convey that you can first discover the sour news about sugar (Sugar Shock) and then get a simple, empowering six-week program to Break Free (Beyond Sugar Shock). By the way, I invite you to learn about the exciting recent endorsements received from such amazing peoople as Dr. Wayne Dyer, Dr. Christiane Northrup, Dr. Daniel Amen, Dr. Bernie Siegel, Bryan Tracy, Marci Shimoff, and John Assaraf. In addition, my next book has been praised by such sugar gurus Dr. Jacob Teitelbaum (Beat Sugar Addiction Now), Dr. Richard Johnson (The Sugar Fix), Jeff O'Connell (of Sugar Nation fame. Learn more here about other endorsements. Stay tuned also for exciting news about Beyond Sugar Shock Book Launch activities. Anyhow, what do you think of the new banner? Let us know. Do you have a product or business that you’d like to build quickly and steadily? If so, I urge you to listen to this Gab with the Gurus Radio Show that I conducted last year with social media guru Michael A. Stelzner after the release of his book, Launch: How to Quickly Propel Your Business Beyond the Competition. 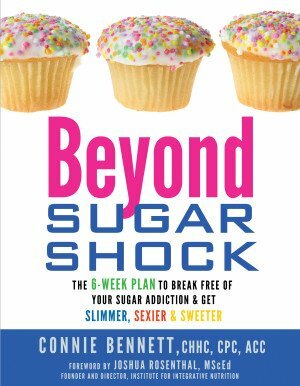 I’m re-listening to this amazing show to get some innovative ideas on how to promote my next book, Beyond Sugar Shock. If you have any hot ideas, please feel free to submit them here. This week marks the three-year anniversary of my show, Gab with the Gurus on BlogTalkRadio. Here is a press release now being distributed about the show. NEW YORK–Starting week, world-renowned “Sleep Doctor” Dr. Michael Breus, love coach Lauren Frances, emotional wellness expert Deborah King, spiritual leader Marianne Williamson, and social media wizard Mike Stelzner appear on the Gab with the Gurus Show (www.GabWithTheGurus.com), which is celebrating its three-year anniversary. The Gab with the Gurus Show—which is hosted by internationally recognized speaker, bestselling author, journalist, and Freedom Coach Connie Bennett—regularly presents internationally acclaimed guests, who are bestselling authors, celebrities, and recognized experts from a variety of fields. Gab with the Gurus guests give worldwide listeners valuable, life-changing information about a variety of subjects, including health, fitness, wealth, social networking, business development, self-help, personal empowerment, the Law of Attraction, business, blogging, social networking, relationships, human potential, self-growth, celebrities, and more. The show–which airs on the acclaimed BlogTalkRadio.com–also features popular TV and film stars, as well as best-selling fiction writers. “Every week, we’re pleased to present internationally recognized gurus and celebrities, who are here to educate, empower and motivate listeners to Get a Life That Rocks™,” says Gab with the Gurus founder and host Connie Bennett. 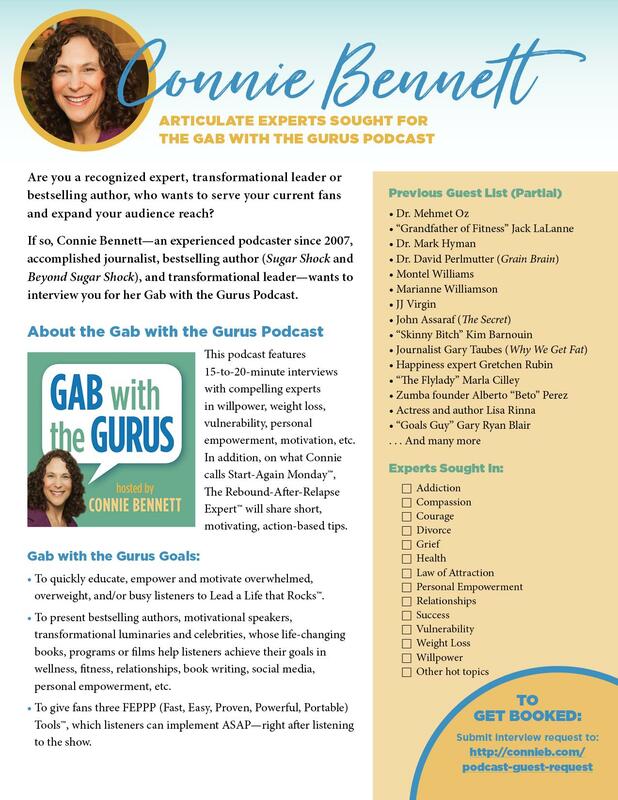 “Each guest gives listeners one or more simple tips that are easy to implement immediately,” adds Bennett, who normally hosts the Gab with the Gurus Show every Wednesday at 2 pm EST. The Gab with the Gurus Radio Show was founded in June 2008 by author, speaker, and coach Connie Bennett. Previously, on July 10, 2007, she had created the Stop Sugar Shock Show, which she renamed a year later to more accurately reflect the broad scope of topics covered. The Gab with the Gurus Shows airs on the popular, fast-growing www.BlogTalkRadio.com, the first and largest online radio citizen broadcasting network. BlogTalkRadio—which attracts 7 million listeners each month—was hailed as “a populist force in cyberspace” by Washington Post media critic Howard Kurtz. Again, to listen to the Gab with the Gab Gurus Show, go live at 2 pm EST Wed. to www.GabWithTheGurus.com. Also, listen later at www.sugarshockblog.com and www.facebook.com/gabwiththegurus, or via iTunes. Gab with the Gurus host Connie Bennett is an acclaimed speaker, journalist, certified life coach, certified health coach, and author of the Sugar Shock: How Sweets and Simple Carbs Can Derail Your Life—And How You Can Get Back on Track (Berkley Books), which has been praised by Dr. Mehmet Oz, Dr. Christiane Northrup, Marilu Henner, Dr. Joseph Mercola and others. 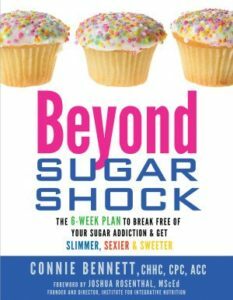 Her next book, The Beyond Sugar Shock Diet: The 6-Week Plan to Break Free of Your Sugar Addiction & Get a Slimmer, Sexier & Sweeter Life, will be published in 2012 by Hay House. Now sugar-free (mostly) for 13 years, Connie helps people easily release their sugar addiction and other bad habits (what he calls babits™). Her Sugar Freedom Now Course (or Break Free of Your Sugar Addiction in 6 Weeks)–available via teleseminar and webinar–has drawn rave reviews from fans around the world. 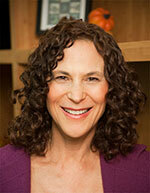 Learn more about the Sour Side of Sugar in this fascinating article on DailyRx.com from reporter Laurie Stoneham. FYI, I'm one of the experts quoted in this story, "The Dark Side of Sweet: Sugar is everywhere and it may just be killing you." Read this important article on DailyRx now. Then, tell us: Does this article help inspire you to quit the stuff — or at least reduce your consumption? If you're stumped as to how to let go of your sugar habit, join me next Thursday week in a free teleseminar. Sign up here for the program, Fast-Track Secrets to Release Your Sugar Addiction & Shed Excess Weight. Now, tell us why do you want to quit your sugar addiction?